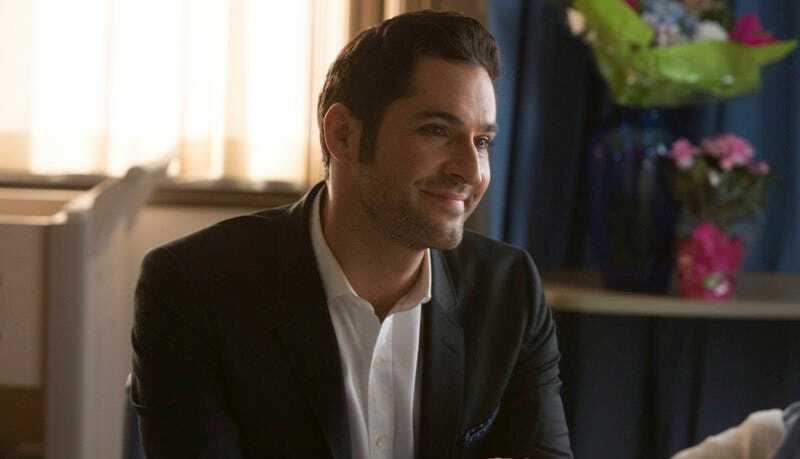 Lucifer (Tom Ellis) in the winter finale episode. Image: Michael Courtney/FOX. Lucifer has been on hiatus since late January, when a two-part episode saw Lucifer realizing the true nature of his relationship with Chloe, as well as traveling back to Hell to rescue her from a deadly poison. Now we’ve got a peek at the show’s return next month, with the introduction of a key new character. We already knew he was going to show up eventually, but it’s God, aka Dad (played by Galavant’s Timothy Omundson), who’s poised to bring even more chaos to Lucifer’s life than even his meddling mother. This preview contains not much of anything pertaining to Chloe and/or police work, so could a new direction for the show be in store? (Of course, there was also that Valentine’s Day-timed promo that focused on nothing but Chloe and Lucifer’s will-they-or-won’t-they relationship.) We’ll find out when Lucifer returns to Fox for its spring premiere on May 1.